Dry your washing outside when you can; if you have to dry your washing inside use a clothes airer and keep the door closed and window open. Make sure rooms are always well ventilated – keep vents on UPVC windows open. Or open your windows briefly each day. Always use extractor fans in the bathroom and kitchen when bathing or cooking. Ensure your home is at a constant warm temperature. 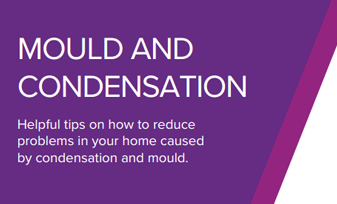 For more information on preventing mould and condensation visit the Centre of Sustainable Energy’s website.